JANUARY 8, 2019 – The company that claims to have expertise in coal mining with a prudent track record of managing a contract miner has reportedly not pulled out of negotiations to take over the Navajo Generating Station and Peabody Coal Mine in Kayenta. According to the January 4, 2019 report in the Navajo Times, the Navajo Transitional Energy Company’s board has unanimously approved the ongoing negotiations. When Navajo Nation asked the energy company for help taking control of the plant last November, NTEC say they assembled a team of energy experts to help work out the deal. CEO Clark Moseley told reporters last week NTEC will continue negotiations with SRP and Peabody Energy and in the meantime conduct further feasibility studies into the possibility of such an acquisition. NOVEMBER 7, 2018 – Days away from voters making some crucial decisions at the polls, an update to a story from last week about a rumor that Navajo Nation is considering the equivalent to a hail mary in order to keep Navajo Generating Station open beyond Salt River Project’s slated Dec 2019 closure date with hopes of keeping both the Navajo and Hopi tribes from facing major economic hardship. For the Hopi coal workers in Kayenta the results of the mine closure could be catastrophic. 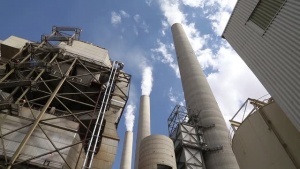 Tribal leaders releasing word this past week that a major tribal entity has shown interest in assisting the Navajo Nation in the purchase of the coal plant. Cheaper power options the claimed motivation behind SRP’s decision with what they say will be a more cost effective path for their customers. With both NGS and the Peabody coal mine in Kayenta facing expiration date with the SRP closure looming in just thirteen months, tribal leaders say they are now considering an option to purchase Navajo Generation Station themselves with the help of the Navajo Transitional Energy Company, after Navajo Nation Council members requested the assistance. Earlier this summer, Navajo Nation leaders were reportedly in negotiations with New York-based Avenue Capital and Chicago-based Middle River Power, but talks fell through after the energy giants claimed they were unable to determine a consumer base for the power should they buy the plant, even with a proposed partial shutdown that would have resulted in the coal plant operating at 40 percent capacity. The issue becomes a major bone of contention in an election year for current tribal Vice President Jonathan Nez who is facing former Nation President Joe Shirley Jr. in the Navajo Nation General Election Tuesday November 6. Nez and Shirley have both seemed critical of the roles outgoing tribal President Russell Begaye and retiring tribal Speaker LoRenzo Bates have played in finding a solid resolution to keep NGS open beyond 2019. The Navajo Transitional Energy Company released an official statement Thursday November 1, that it’s now considering ownership of the plant “at the invitation of the tribe”; the company’s chief executive Clark Moseley, told AP reporters “he expects to have a plan for the 2,250-megawatt plant in place by the end of the year”. According to Ryan Randazzo, business and legislative reporter for The Arizona Republic, AZ Central and the USA Today , Mike Hummel, CEO of Salt River Project was asked by an undisclosed board member November 6th about Navajo plans to take over coal plant, Hummel reportedly responded that the “(They) will face the same problems that any other potential owner, including the current owners, will have with that coal plant”. Read the Arizona Republic‘s perspective here.